ORLANDO, Fla., May 4, 2016 /Weed Wire/ — The Cannabis industry is anticipated to grow to $17.5 billion by the year 2020, and the first-ever reality show about investing in Cannabis, is looking for the next crop of Ganjapreneurs to join winners who have already offered over $18 million in investments, and brought a cannabis car, a major Hollywood “stoner comedy”, a cannabis advertising agency, and a line of CBD-infused dog bones to the market. Last December The Marijuana Show received their own investment of over a million dollars to invest in their parent company Green Equity Media, LLC. The show’s producers have proven their model as a business accelerator by working to mentor and train contestants to ultimately land an investment. At Green Equity Media, the company has a robust online platform where accredited investors, Ganjapreneurs and fans can watch, rate, review and share their favorite pitches; plus accredited investors can invest in a deal or Cannabis equity fund. Anyone over age 21 with a pitch is eligible to audition. 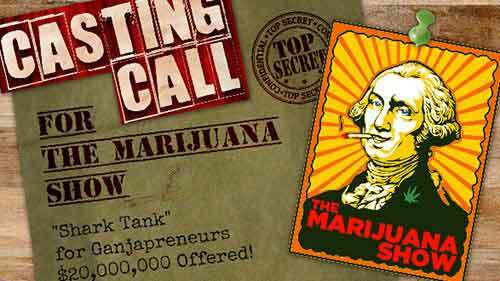 To audition for season three of The Marijuana Show visit: www.themarijuanashow.com. Robbins and Paull will attend this year’s Marijuana Business Conference and Expo in Orlando, FL May 9-11 at The Gaylord Palms. To schedule an interview, please contact Shawna McGregor, The Rosen Group, 917 971 7852 or shawna@rosengrouppr.com. For more information, visit https://www.themarijuanashow.com/.